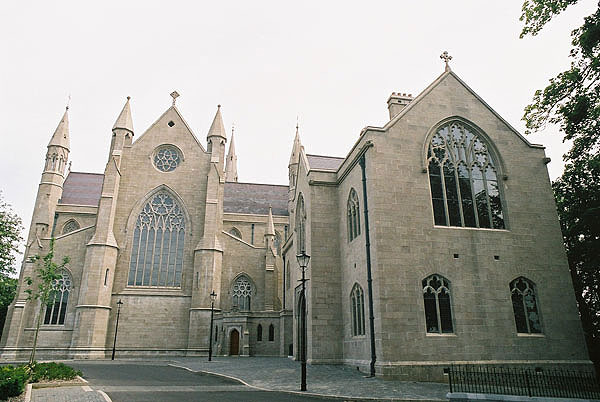 The second of the cathedrals of Armagh, the Roman Catholic Cathedral is sited on a hill to compete with the older Church of Ireland Cathedral. 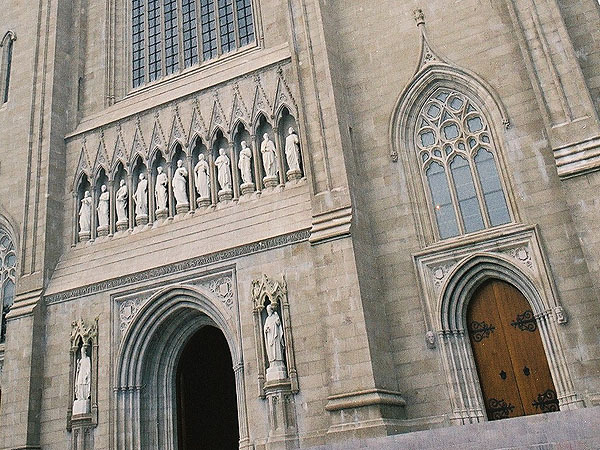 This cathedral has a chequered history with many architects involved. 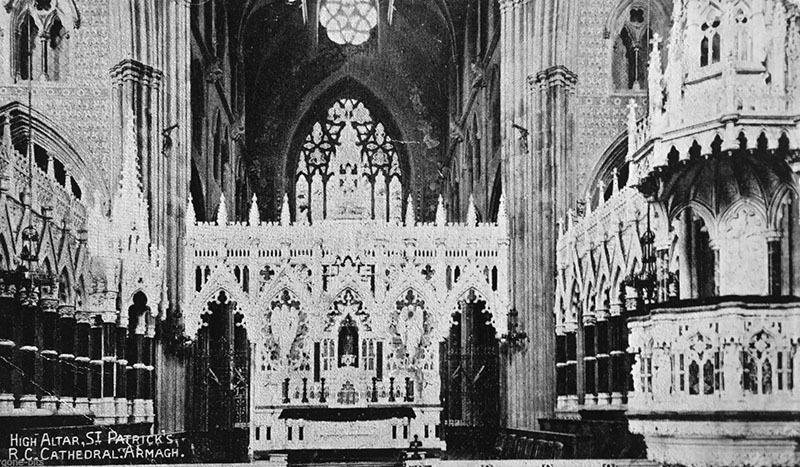 The original building was commenced in 1840 by Thomas Duff of Newry in a 16th century gothic idiom. 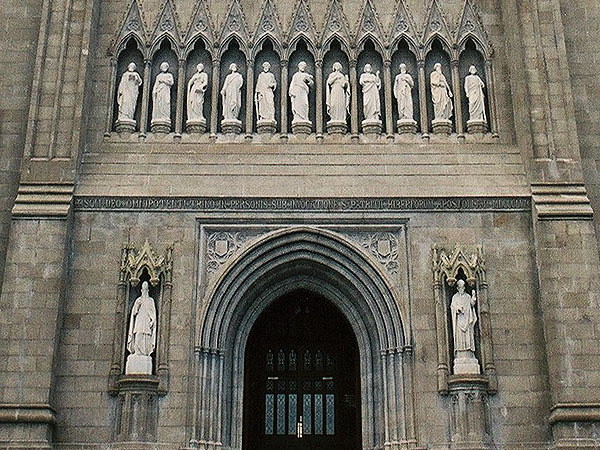 This was stopped due to the Famine. 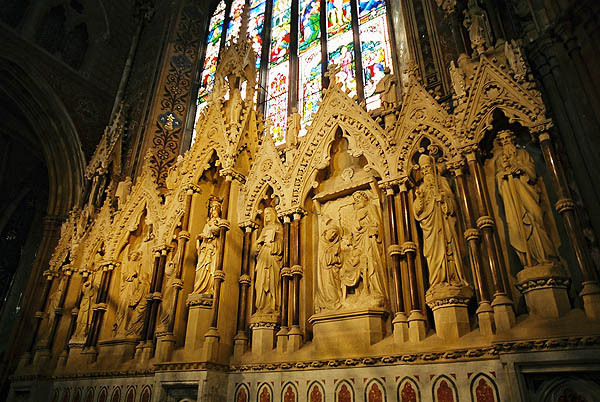 It was started again in 1850 by J.J. McCarthy is his favoured 14th century gothic and completed around 1870. 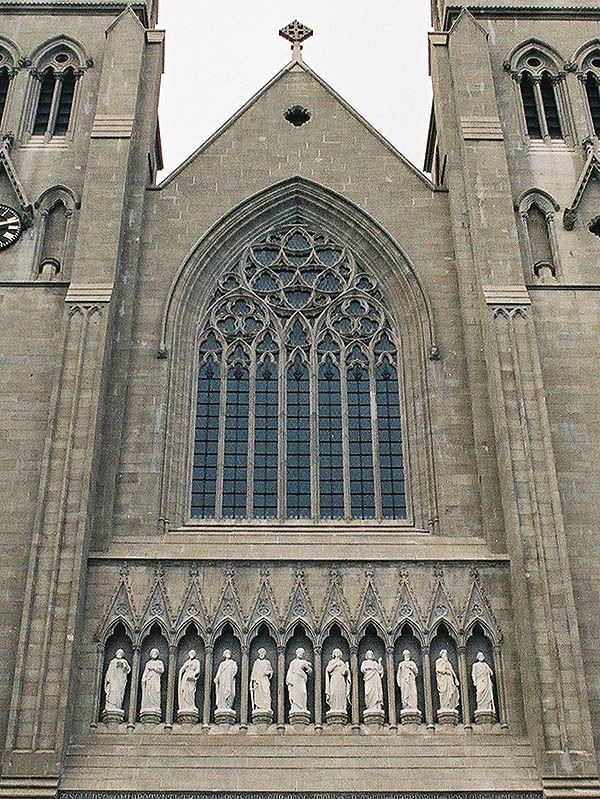 The change in architectural style can be seen on the main front where the entrane doorways and aisle windows are at odds with the design of the rest of the building. 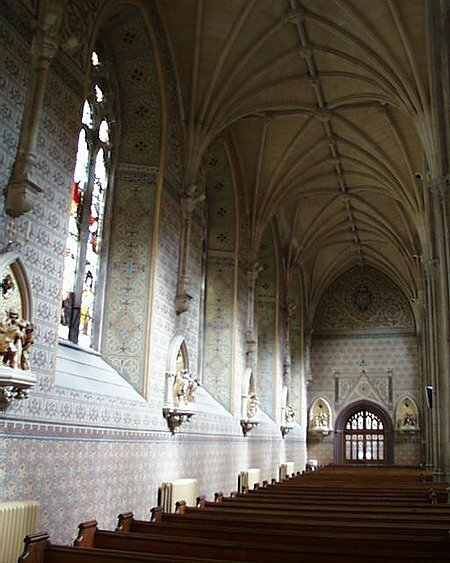 The original interior with its mosaics, marble, gilt and fittings was designed by G.C. 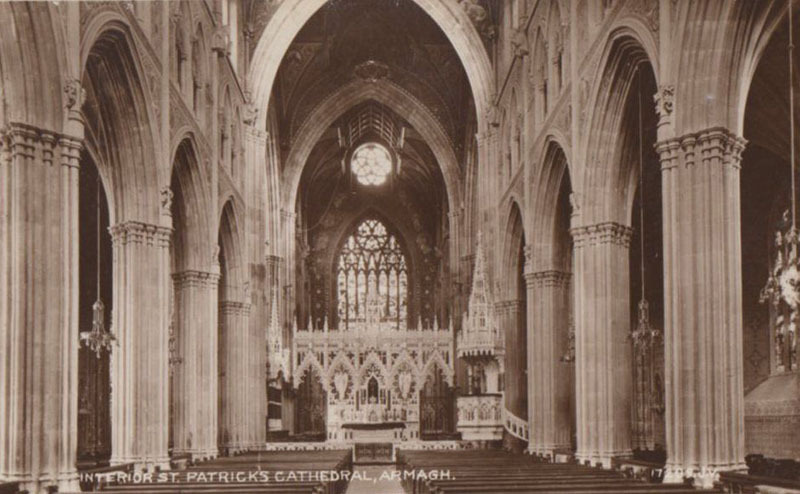 Ashlin and was mostly removed by Liam McCormack during his post Vatican II renovations in 1977-82. 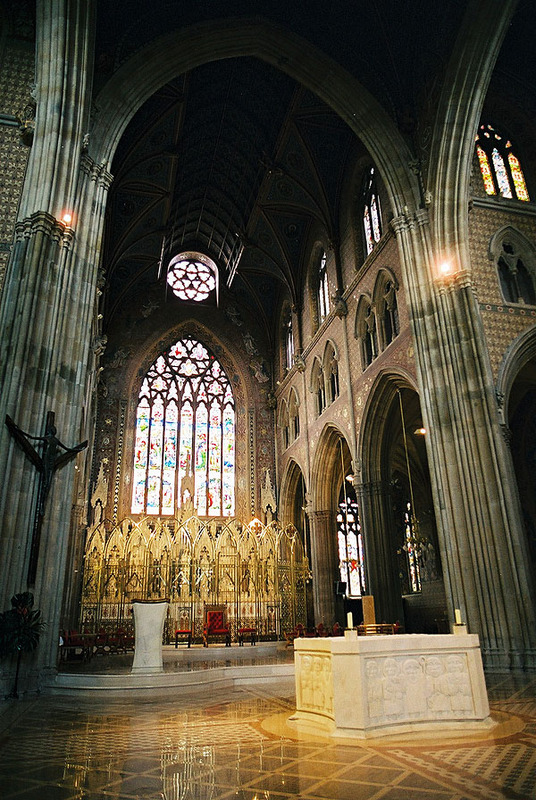 Like at nearby St. Macartans in Monaghan, this reorganisation of the sanctuary ruined the interior of the building. 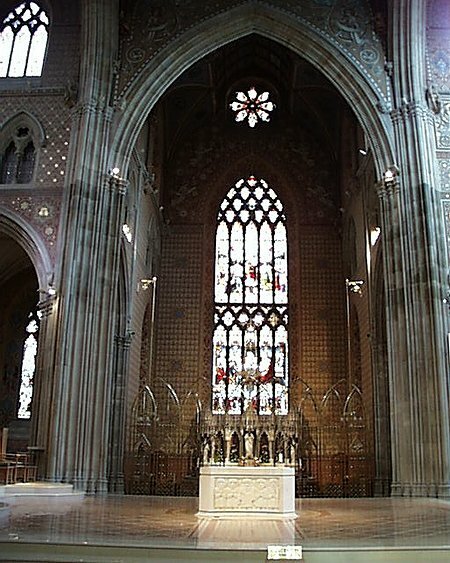 In 2003 the cathedral reopened after a major restoration. 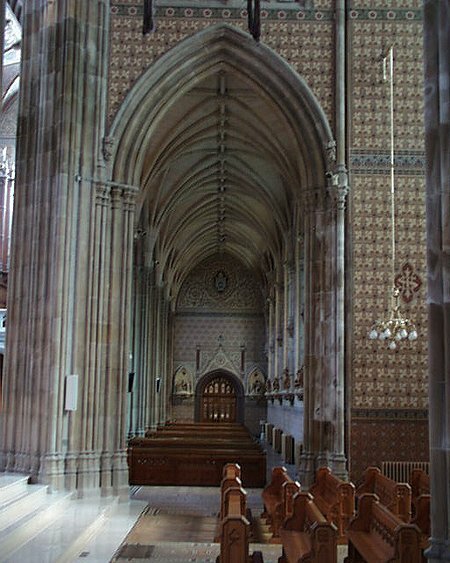 This restoration removed many of the mistakes of the previous reordering. 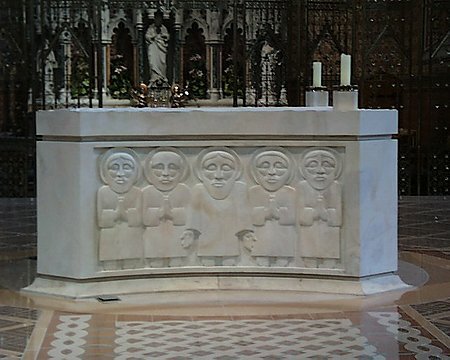 In particular the altar area has lost the intrusive tabernacle and altar (Liam McCormack). 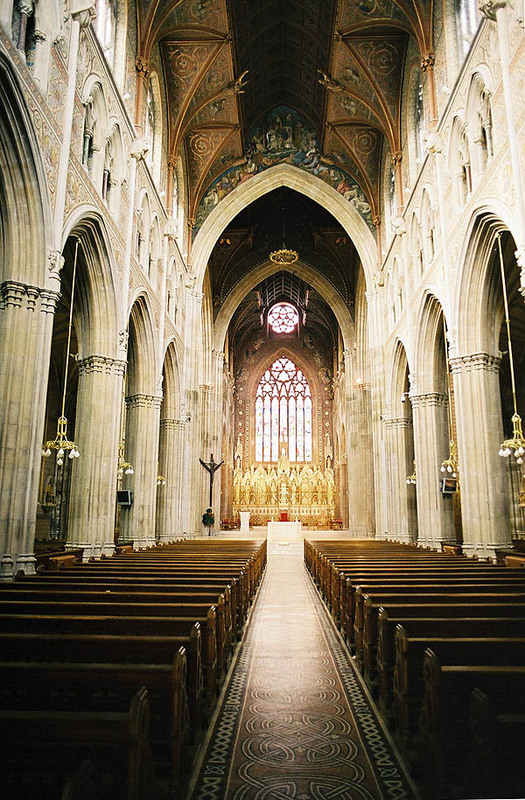 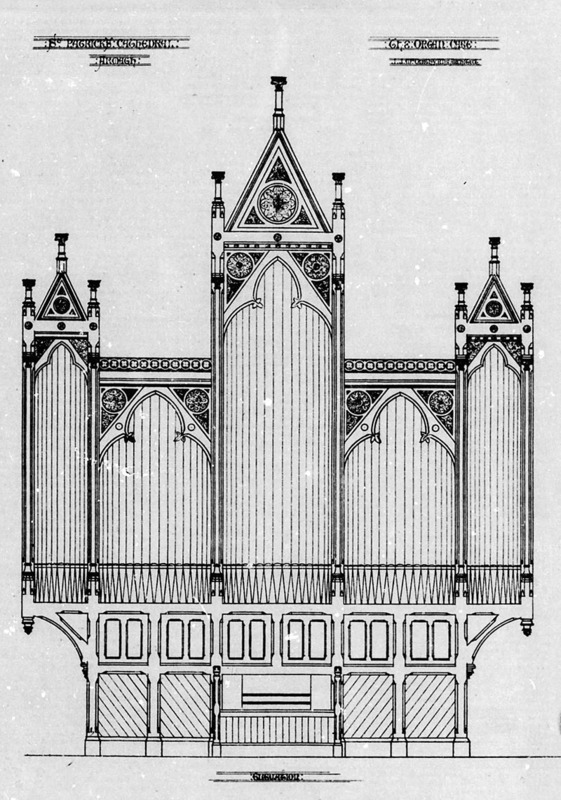 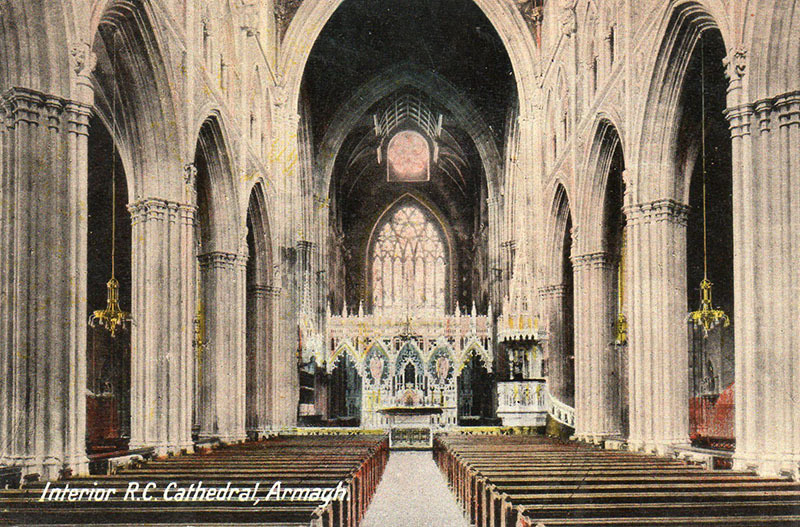 A description of the cathedrals interior at consecration was given in The Irish Builder, September 1 1873: “On Sunday, the 24th ult., this Roman Catholic cathedral,” was consecrated. 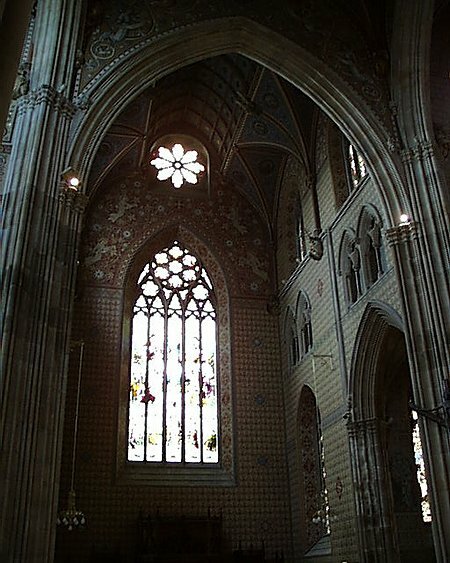 It is stated that the building has already cost upwards of £60,000, and there remains much in connection with the exterior and interior to be completed yet. 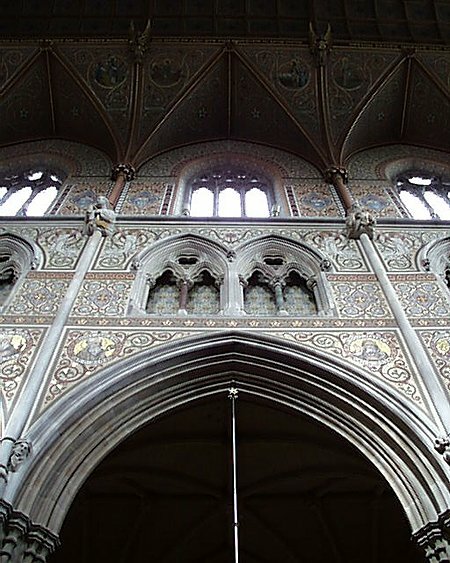 During the progress of the works the architectural features of the building have been often described. 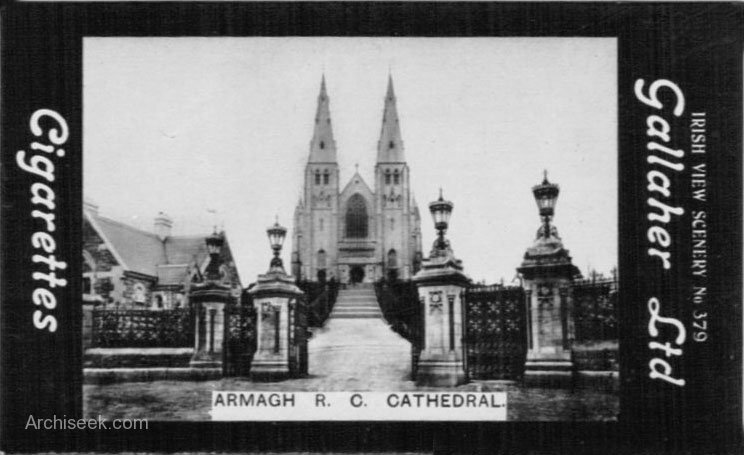 For the present it will suffice to say that it is erected on the west of a hill in the immediate vicinity of Armagh, to the north-east of the town. 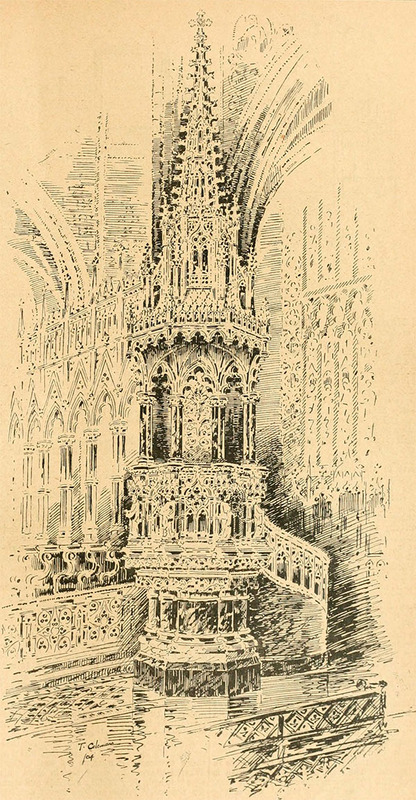 From any portion of the pathway around it splendid views of the surrounding district can be had, while for miles around the tall spires which surmount the front towers are distinctly recognisable. 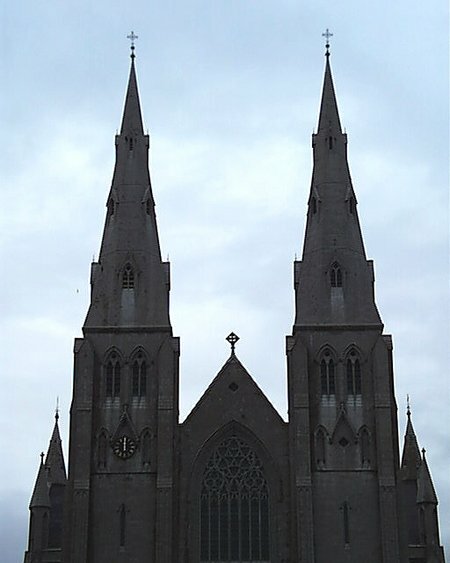 It is built in the form of a cross, the arms extending almost due north and south. 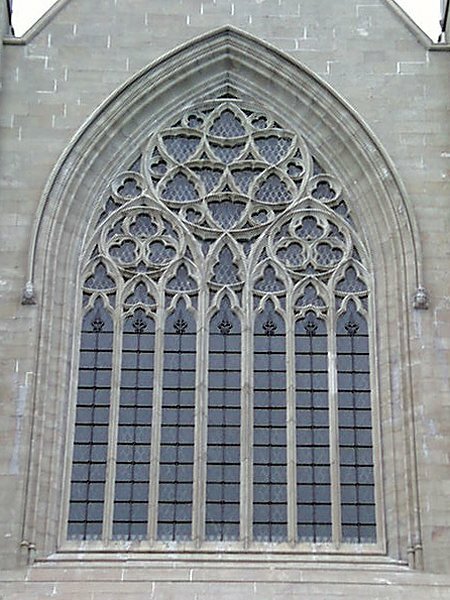 In style it is in the main Decorated Gothic, but in the front specially are several noticeable departures from the original design. 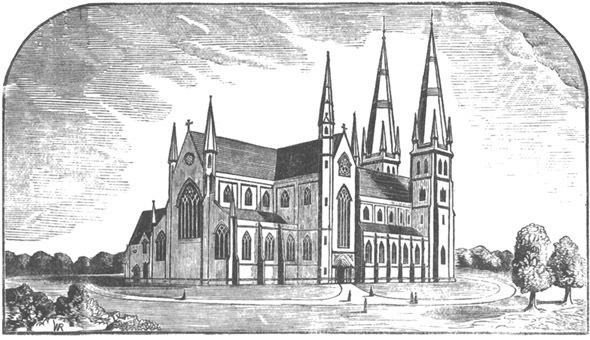 Those are to some extent accounted for by the revolution which between 1841 and 1854 took place in church architecture, and the fact that successive architects who have had charge of the £ thought it well to make changes more or less extensive in the original plans. 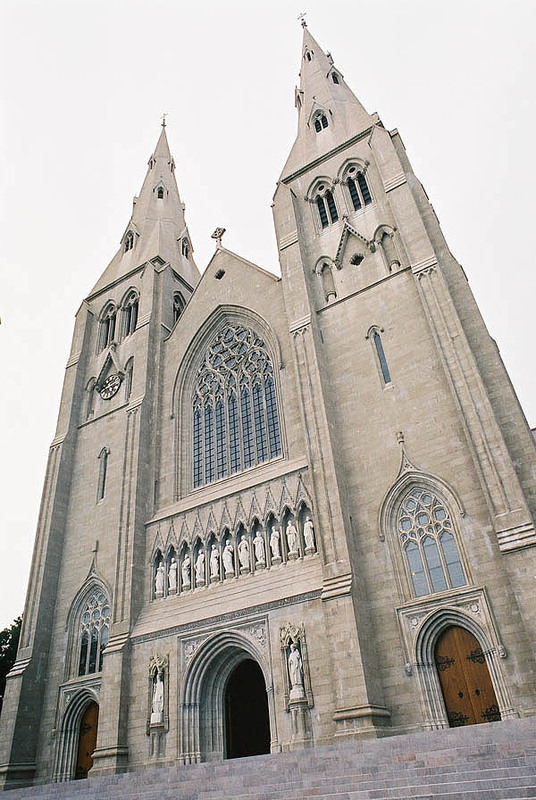 These changes have naturally produced a rather mixed style in the appearance of the building viewed as a whole, but still the mixture of style does not detract from the beauty of the edifice. 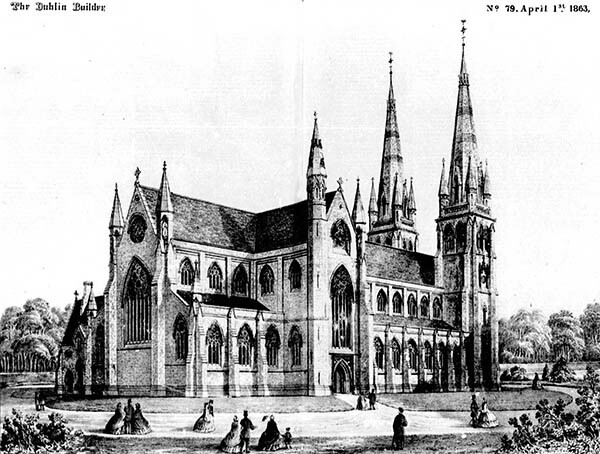 The foundation-stone was laid on the 17th of March, 1838—more than thirty-five years ago.